I recently hiked six miles into a valley of Olympic National Park, straight into a temperate rain forest. I’d never experienced one before and it was certainly something to behold—a forest of trees so big and so old, packed with every other type of greenery in between, that I couldn’t help but wonder exactly what the U.S. was like when those trees were saplings. My campsite was seclusion. I, in a ENO hammock, by my lonesome in the dry part of a creek-bed next to a running river. Because I knew I’d be by myself and those woods were full of bear and mountain lions, I refrained from bringing any food with me. I simply loaded up for dinner and hit the trail. I felt great and full all night. The evening was, quite simply, delightful. But the morning greeted me with a deep hunger than pulled at my stomach for sustenance. I enjoyed the river briefly before packing up and heading back to the car. By the time I got a couple miles into the hike, it felt like tiny hands were pulling back the lining of my stomach and I could tell that my sugar was low. I stumbled two more miles and came upon a field of most fortunate nature. I have never had more delicious berries. The ripest fell into my hand with the slightest touch, as if the faintest whisper would have had the same effect. The soft balloons exploded with flavor of berry so sweet that they immediately reminded me of the last few sips of blue Fla-Vor-Ices that were ever-present in my childhood summers. I picked and picked the delicious little desserts until a half hour passed and my mouth, stomach, future children, clothing, and vision were most certainly brilliant shades of purple. Overcome, I couldn’t help but be grateful that God made edible plants to sustain humans and for us to enjoy them, in general and specifically that I had them on this occasion to sustain and re-energize me. But I also couldn’t help but wonder how much we’ve forgotten, as western people. 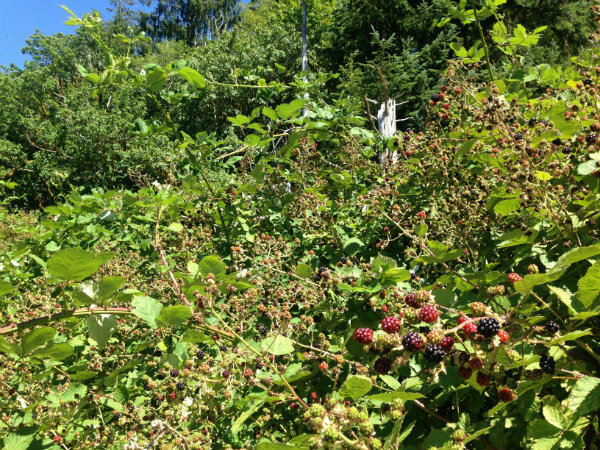 I know a fair bit about edible plants, but my blackberry oasis pushed me further to learn how to cultivate what I know and learn more about what I don’t. And so I think I will. In the meantime, I hope I’m always aware enough and grateful enough to truly enjoy the patches of blackberries as I come upon them. *Never eat anything from the wild unless you’re completely sure it is safe.